Made in New England: Stonewall Kitchen Sriracha Cheddar Cheese Sticks, 4oz. 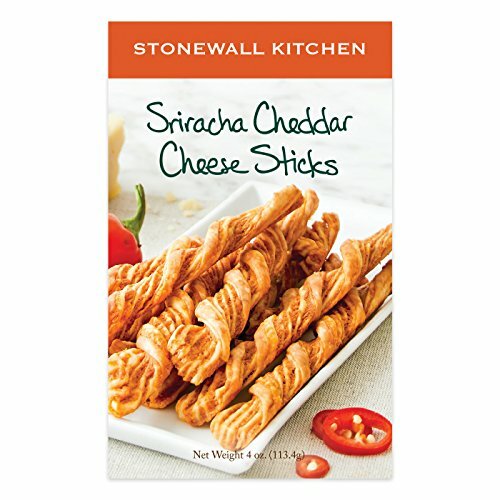 Stonewall Kitchen Sriracha Cheddar Cheese Sticks, 4oz. If you love spice, you're no doubt familiar with Sriracha. Fans of the spicy Thai sauce are in luck: with these cheese sticks, we've gone ahead and added a healthy dose for you! Our twist on a classic hors d'oeuvre gives these crunchy snacks a satisfying sizzle that perfectly complements the two-cheese blend of asiago and cheddar. Crispy, salty and spicy, our cheese sticks are a fun alternative to croutons in soups or salads and are ideal for munching straight from the box.